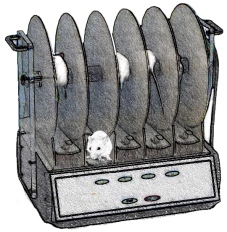 In the Rotarod test a rodent is placed on a rotating rod. The speed of rotation is gradually increased and the rodent’s ability to remain on the rotating rod is recorded. The purpose of the Rotarod test is to assess the rodent’s sensorimotor coordination. The test is sensitive to damage in the basal ganglia and cerebellum and to drugs that effect motor function.